Whether you're moving on or moving up, getting into a new home can be stressful. Lindsey recently moved with the help of Smith Banfield, founder of Clear Space and member of The Container’s Store’s Contained Home service. Smith specializes in helping clients cultivate order and beauty at home. Together, along with some of The Container Store’s tried and true solutions, they created an organized, yet livable, New York City space for the Boyd party of four. Smith provided a wealth of tips for moving mindfully. First and foremost, she recommended moving in, and then making a list of which items are needed to begin organizing. She strongly advises against buying organizational solutions prior to a move, mainly because she feels it’s important to get a feel for the space first. Her only exception is closet spaces, which can be optimized ahead of time. To do this, Smith visited Lindsey’s previous space first and then headed to her new space to evaluate how closet contents might fit (or not fit). 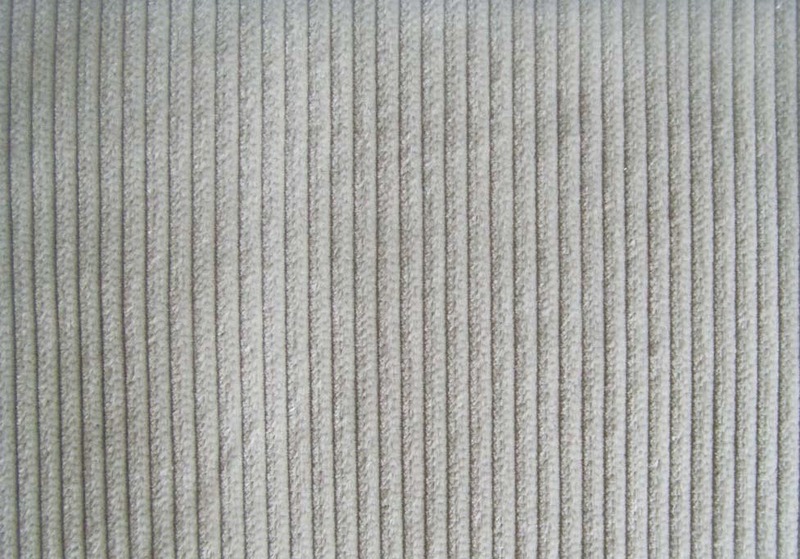 Left to its own devices, a linen closet can quickly fall into disrepair. Creating a usable order is crucial. 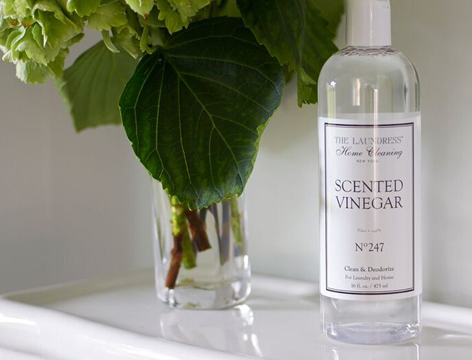 With this in mind, Smith and Lindsey set out to create a space located centrally – on the way to the bathroom. Lindsey chose the elfa system from The Container Store, so the shelving space can be adjusted and changed over time to account for shifting needs. 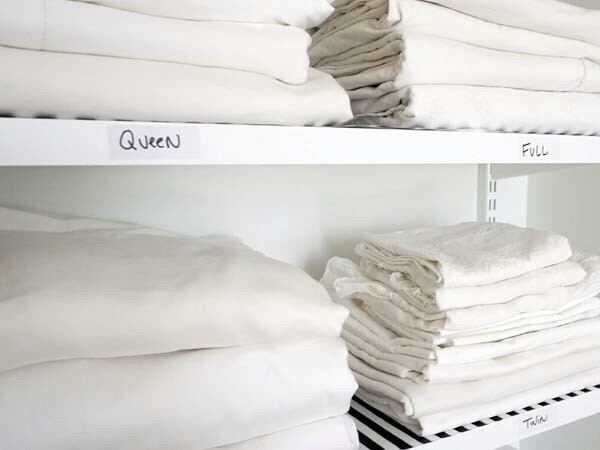 The shelves were lined using The Laundress Shelf & Drawer Liners to give the space a polished look. 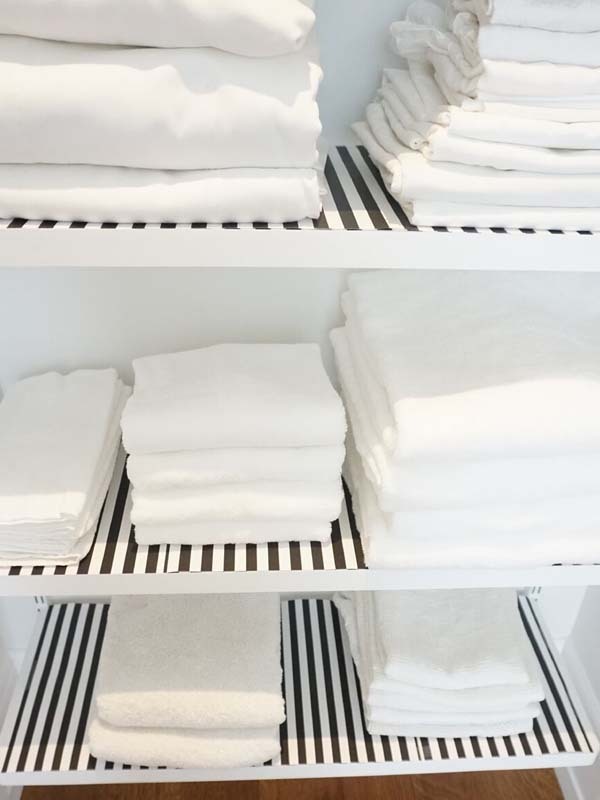 The black and white stripes add a pop of interest among her white linens, and the Classic scent ensures that the space always has that clean laundry smell. Next, the pair worked together to add labels to differentiate sheet sets for different bed sizes. We’ve all been in a situation where you unfold a set of sheets only to discover that they don’t fit the bed you’re making, and it’s back to the linen closet. Problem solved with this simple solution. 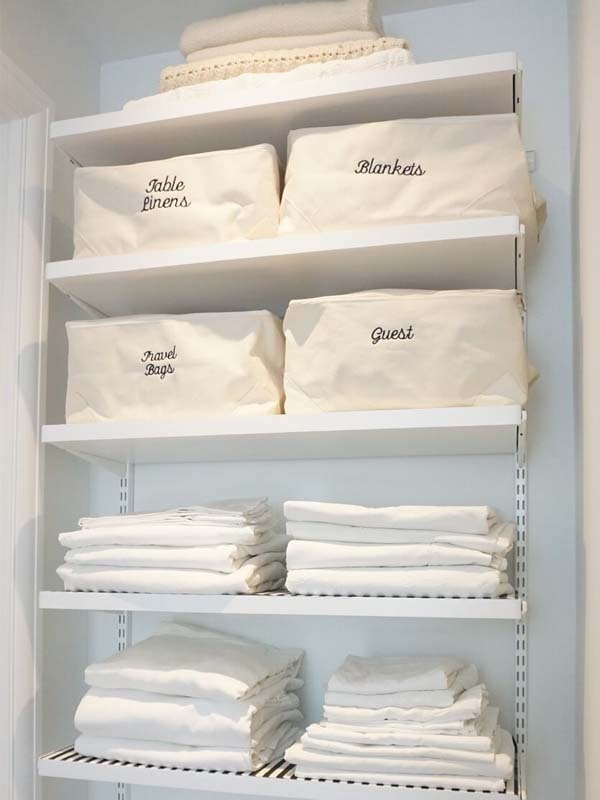 Looser items like toiletry bags, table linens, and guest towels fit nicely into The Laundress Beckel canvas bags. Lindsey chose the Medium Storage Bags and had them embroidered for easy identification. Because many of these items aren’t accessed daily, they work best on the higher shelves. Smith pointed out that it’s best to have your most used items at eye level or on easy to reach shelves. 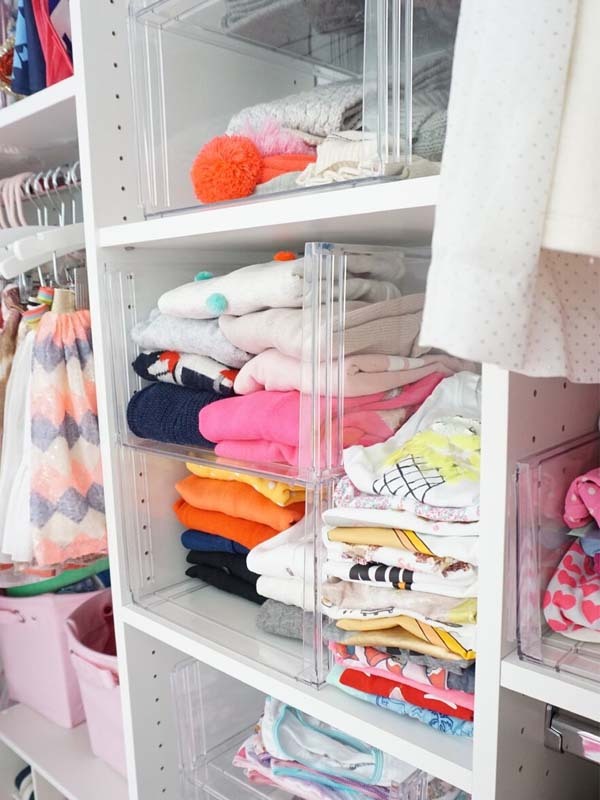 Lindsey’s daughter, Chloe, was lucky enough to land a bigger, adult-sized closet in her new room. With an existing built-in shelving system, the challenge became optimizing the space to be best used for a child. Step one was separating dress-up clothes from everyday clothes for easy access. The top shelves were dedicated to linens that only Mom and Dad need to reach. 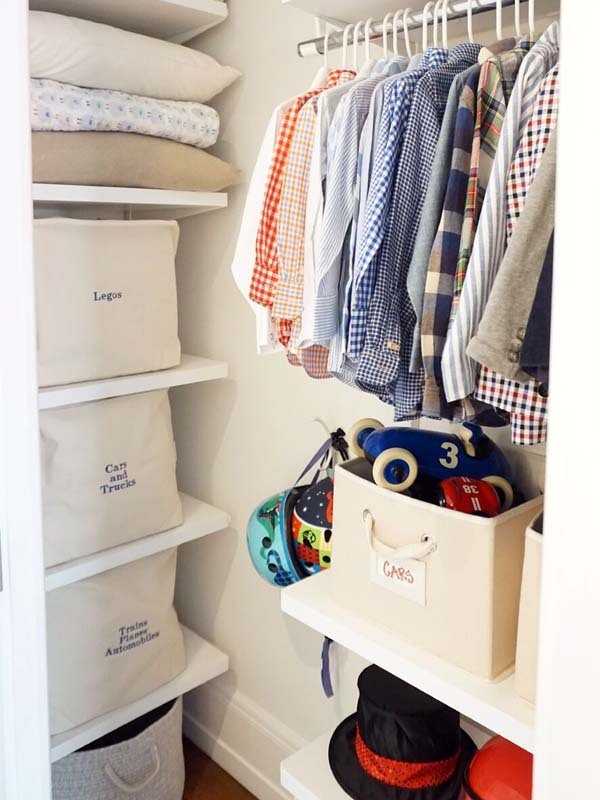 In true boy fashion, Lindsey’s son, William, needed less space for clothing and accessories than his big sister. With this in mind, clothes like button downs and sport jackets were left hanging, while play clothes were moved to a nearby dresser. Shoes were stowed in easily accessed cubbies at the bottom of the closet. This left more room for toys to be organized and stored in the closet, resulting in more floor space in William’s bedroom to play. Lindsey chose the Storage Cubes from The Laundress to house many of William’s toys and costumes. 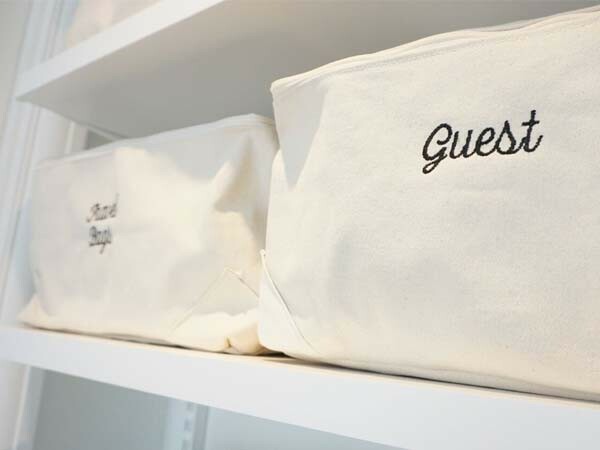 The bags were each embroidered with the name of their respective contents for easy location in the closet. 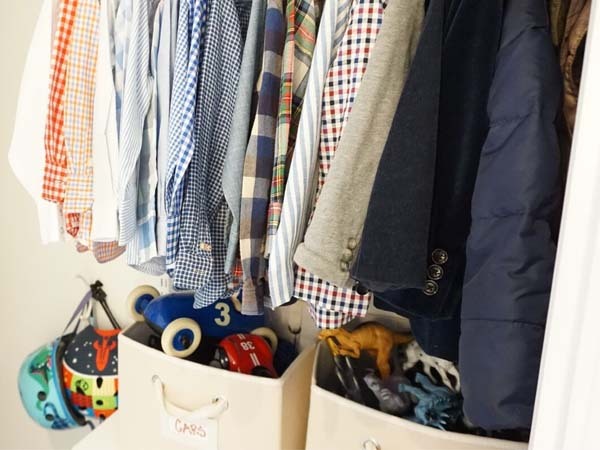 Bulkier items went into open canvas bins to allow room for spillover – and easy access for William! To learn more about Smith Banfield’s services, visit her website.